In archaeology, the classic Maya collapse refers to the decline of Maya civilization and abandonment of Maya cities in the southern Maya lowlands of Mesoamerica between the 8th and 9th centuries, at the end of the Classic Maya Period. Preclassic Maya experienced a similar collapse in the 2nd century. The Classic Period of Mesoamerican chronology is generally defined as the period from 250 to 900, the last century of which is referred to as the Terminal Classic. The Classic Maya collapse is one of the greatest unsolved mysteries in archaeology. Urban centers of the southern lowlands, among them Palenque, Copán, Tikal, Calakmul, went into decline during the 8th and 9th centuries and were abandoned shortly thereafter. Archaeologically, this decline is indicated by the cessation of monumental inscriptions and the reduction of large-scale architectural construction at the primary urban centers of the Classic Period. Although termed a 'collapse', it did not mark the end of the Maya civilization; Northern Yucatán in particular prospered afterwards, although with very different artistic and architectural styles, and with much less use of monumental hieroglyphic writing. In the Post-Classic Period following the collapse, the state of Chichén Itzá built an empire that briefly united much of the Maya region, and centers such as Mayapán and Uxmal flourished, as did the Highland states of the K'iche' and Kaqchikel Maya. Independent Maya civilization continued until 1697 when the Spanish conquered Nojpetén, the last independent city-state. Millions of Maya people still inhabit the Yucatán peninsula today. Because parts of Maya civilization unambiguously continued, a number of scholars strongly dislike the term "collapse." Regarding the proposed collapse, E. W. Andrews IV went as far as to say, "in my belief no such thing happened." The Maya often recorded dates on monuments they built. Few dated monuments were being built circa 500 - around ten per year in 514, for example. The number steadily increased to make this number twenty per year by 672 and forty by around 750. After this, the number of dated monuments begins to falter relatively quickly, collapsing back to ten by 800 and to zero by 900. Likewise, recorded lists of kings complement this analysis. Altar Q at Copán shows a reign of kings from 426 to 763. One last king not recorded on Altar Q was Ukit Took, "Patron of Flint", who was probably a usurper. The dynasty is believed to have collapsed entirely shortly thereafter. In Quirigua, twenty miles north of Copán, the last king Jade Sky began his rule between 895 and 900, and throughout the Maya area all kingdoms similarly fell around that time. A third piece of evidence of the progression of Maya decline, gathered by Ann Corinne Freter, Nancy Gonlin, and David Webster, uses a technique called obsidian hydration. The technique allowed them to map the spread and growth of settlements in the Copán Valley and estimate their populations. Between 400 and 450, the population was estimated at a peak of twenty-eight thousand between 750 and 800 - larger than London at the time. Population then began to steadily decline. By 900 the population had fallen to fifteen thousand, and by 1200 the population was again less than 1000. Some 88 different theories or variations of theories attempting to explain the Classic Maya Collapse have been identified. From climate change to deforestation to lack of action by Maya kings, there is no universally accepted collapse theory, although drought is gaining momentum as the leading explanation. The archaeological evidence of the Toltec intrusion into Seibal, Peten, suggests to some the theory of foreign invasion. The latest hypothesis states that the southern lowlands were invaded by a non-Maya group whose homelands were probably in the gulf coast lowlands. This invasion began in the 9th century and set off, within 100 years, a group of events that destroyed the Classic Maya. It is believed that this invasion was somehow influenced by the Toltec people of central Mexico. However, most Mayanists do not believe that foreign invasion was the main cause of the Classic Maya Collapse; they postulate that no military defeat can explain or be the cause of the protracted and complex Classic Collapse process. Teotihuacan influence across the Maya region may have involved some form of military invasion; however, it is generally noted that significant Teotihuacan-Maya interactions date from at least the Early Classic period, well before the episodes of Late Classic collapse. The foreign invasion theory does not answer the question of where the inhabitants went. David Webster believed that the population should have increased because of the lack of elite power. Further, it is not understood why the governmental institutions were not remade following the revolts, which actually happened under similar circumstances in places like China. A study by anthropologist Elliot M. Abrams came to the conclusion that buildings, specifically in Copan, did not actually require an extensive amount of time and workers to construct. However, this theory was developed during a time period when the archaeological evidence showed that there were fewer Maya people than there are now known to have been. Revolutions, peasant revolts, and social turmoil change circumstances, and are often followed by foreign wars, but they run their course. There are no documented revolutions that caused wholesale abandonment of entire regions. It has been hypothesized that the decline of the Maya is related to the collapse of their intricate trade systems, especially those connected to the central Mexican city of Teotihuacán. Preceding improved knowledge of the chronology of Mesoamerica, Teotihuacan was believed to have fallen during 700–750, forcing the "restructuring of economic relations throughout highland Mesoamerica and the Gulf Coast". This remaking of relationships between civilizations would have then given the collapse of the Classic Maya a slightly later date. However, after knowing more about the events and the time periods that they occurred, it is now believed that the strongest Teotihuacan influence was during the 4th and 5th centuries. In addition, the civilization of Teotihuacan started to lose its power, and maybe even abandoned the city, during 600–650. This differs greatly from the previous belief that Teotihuacano power decreased during 700–750. But since the new decline date of 600–650 has been accepted, the Maya civilizations are now thought to have lived on and prospered “for another century and more” than what was previously believed. Rather than the decline of Teotihuacan directly preceding the collapse of the Maya, their decline is now seen as contributing “to the 6th century ‘hiatus’”. The disease theory is also a contender as a factor in the Classic Maya Collapse. Widespread disease could explain some rapid depopulation, both directly through the spread of infection itself and indirectly as an inhibition to recovery over the long run. According to Dunn (1968) and Shimkin (1973), infectious diseases spread by parasites are common in tropical rainforest regions, such as the Maya lowlands. Shimkin specifically suggests that the Maya may have encountered endemic infections related to American trypanosomiasis, Ascaris, and some enteropathogens that cause acute diarrheal illness. Furthermore, some experts believe that, through development of their civilization (that is, development of agriculture and settlements), the Maya could have created a "disturbed environment," in which parasitic and pathogen-carrying insects often thrive. Among the pathogens listed above, it is thought that those that cause the acute diarrheal illnesses would have been the most devastating to the Maya population. This is because such illness would have struck a victim at an early age, thereby hampering nutritional health and the natural growth and development of a child. This would have made them more susceptible to other diseases later in life. Such ideas as this could explain the role of disease as at least a possible partial reason for the Classic Maya Collapse. Mega-droughts hit the Yucatán Peninsula and Petén Basin areas with particular ferocity, as thin tropical soils decline in fertility and become unworkable when deprived of forest cover, and due to regular seasonal drought drying up surface water. Colonial Spanish officials accurately documented cycles of drought, famine, disease, and war, providing a reliable historical record of the basic drought pattern in the Maya region. Climatic factors were first implicated in the Collapse as early as 1931 by Mayanists Thomas Gann and J.E.S. Thompson. In The Great Maya Droughts, Richardson Gill gathers and analyzes an array of climatic, historical, hydrologic, tree ring, volcanic, geologic, lake bed, and archeological research, and demonstrates that a prolonged series of droughts probably caused the Classic Maya Collapse. The drought theory provides a comprehensive explanation, because non-environmental and cultural factors (excessive warfare, foreign invasion, peasant revolt, less trade, etc.) can all be explained by the effects of prolonged drought on Classic Maya civilization. Within the past five years new tools and new data for archaeologists, climatologists, and historians have brought us to the edge of a new era in the study of global and hemispheric climate change and its cultural impacts. The climate of the Holocene, previously assumed static, now displays a surprising dynamism, which has affected the agricultural bases of pre-industrial societies. The list of Holocene climate alterations and their socio-economic effects has rapidly become too complex for brief summary. [Studies of] Yucatecan lake sediment cores ... provide unambiguous evidence for a severe 200-year drought from AD 800 to 1000 ... the most severe in the last 7,000 years ... precisely at the time of the Maya Collapse. Climatic modeling, tree ring data, and historical climate data show that cold weather in the Northern Hemisphere is associated with drought in Mesoamerica. Northern Europe suffered extremely low temperatures around the same time as the Maya droughts. The same connection between drought in the Maya areas and extreme cold in northern Europe was found again at the beginning of the 20th century. Volcanic activity, within and outside Mesoamerica, is also correlated with colder weather and resulting drought, as the effects of the Tambora volcano eruption in 1815 indicate. Mesoamerican civilization provides a remarkable exception: civilization prospering in the tropical swampland. The Maya are often perceived as having lived in a rainforest, but technically, they lived in a seasonal desert without access to stable sources of drinking water. The exceptional accomplishments of the Maya are even more remarkable because of their engineered response to the fundamental environmental difficulty of relying upon rainwater rather than permanent sources of water. “The Maya succeeded in creating a civilization in a seasonal desert by creating a system of water storage and management which was totally dependent on consistent rainfall.” The constant need for water kept the Maya on the edge of survival. “Given this precarious balance of wet and dry conditions, even a slight shift in the distribution of annual precipitation can have serious consequences.” Water and civilization were vitally connected in ancient Mesoamerica. Archaeologist and specialist in pre-industrial land and water usage practices, Vernon Scarborough, believes water management and access were critical to the development of Maya civilization. Critics of the drought theory wonder why the southern and central lowland cities were abandoned and the northern cities like Chichen Itza, Uxmal, and Coba continued to thrive. One critic argued that Chichen Itza revamped its political, military, religious, and economic institutions away from powerful lords or kings. Inhabitants of the northern Yucatán also had access to seafood, which might have explained the survival of Chichen Itza and Mayapan, cities away from the coast but within reach of coastal food supplies. Critics of the drought theory also point to current weather patterns: much heavier rainfall in the southern lowlands compared to the lighter amount of rain in the northern Yucatán. Drought theory supporters state that the entire regional climate changed, including the amount of rainfall, so that modern rainfall patterns are not indicative of rainfall from 800 to 900. LSU archaeologist Heather McKillop found a significant rise in sea level along the coast nearest the southern Maya lowlands, coinciding with the end of the Classic period, and indicating climate change. David Webster, a critic of the megadrought theory says that much of the evidence provided by Gill comes from the northern Yucatán and not the Southern part of the peninsula, where Classic Maya civilization flourished. He also states that if water sources were to have dried up, then several city-states would have moved to other water sources. The fact that Gill suggests that all water in the region would have dried up and destroyed Maya civilization is a stretch, according to Webster. A study published in Science in 2012 found that modest rainfall reductions, amounting to only 25 to 40 percent of annual rainfall, may have been the tipping point to the Maya collapse. Based on samples of lake and cave sediments in the areas surrounding major Maya cities, the researchers were able to determine the amount of annual rainfall in the region. The mild droughts that took place between 800-950 would therefore be enough to rapidly deplete seasonal water supplies in the Yucatán lowlands, where there are no rivers. Some ecological theories of Maya decline focus on the worsening agricultural and resource conditions in the late Classic period. It was originally thought that the majority of Maya agriculture was dependent on a simple slash-and-burn system. Based on this method, the hypothesis of soil exhaustion was advanced by Orator F. Cook in 1921. Similar soil exhaustion assumptions are associated with erosion, intensive agricultural, and savanna grass competition. More recent investigations have shown a complicated variety of intensive agricultural techniques utilized by the Maya, explaining the high population of the Classic Maya polities. Modern archaeologists now comprehend the sophisticated intensive and productive agricultural techniques of the ancient Maya, and several of the Maya agricultural methods have not yet been reproduced. Intensive agricultural methods were developed and utilized by all the Mesoamerican cultures to boost their food production and give them a competitive advantage over less skillful peoples. These intensive agricultural methods included canals, terracing, raised fields, ridged fields, chinampas, the use of human feces as fertilizer, seasonal swamps or bajos, using muck from the bajos to create fertile fields, dikes, dams, irrigation, water reservoirs, several types of water storage systems, hydraulic systems, swamp reclamation, swidden systems, and other agricultural techniques that have not yet been fully understood. Systemic ecological collapse is said to be evidenced by deforestation, siltation, and the decline of biological diversity. In addition to mountainous terrain, Mesoamericans successfully exploited the very problematic tropical rainforest for 1,500 years. The agricultural techniques utilized by the Maya were entirely dependent upon ample supplies of water. The Maya thrived in territory that would be uninhabitable to most peoples. Their success over two millennia in this environment was "amazing." Anthropologist Joseph Tainter wrote extensively about the collapse of the Southern Lowland Maya in his 1988 study, The Collapse of Complex Societies. His theory about Maya collapse encompasses some of the above explanations, but focuses specifically on the development of and the declining marginal returns from the increasing social complexity of the competing Maya city-states. Psychologist Julian Jaynes suggested that the collapse was due to a failure in the social control systems of religion and political authority, due to increasing socioeconomic complexity that overwhelmed the power of traditional rituals and the king's authority to compel obedience. ↑ Acemoglu,Robinson, Daron, James A. (2012). Why Nations Fail. pp. 143–149. ISBN 978-1-84668-429-6. ↑ Abrams, Elliot M. (1994). How the Maya Built Their World. University of Texas. ISBN 978-0-292-70462-6. ↑ Anderson and May (1982); R. Anderson (1982); Lycett (1985). ↑ Medina-Elizalde, Martín; Rohling, Eelco J. (24 Feb 2012). "Collapse of Classic Maya Civilization Related to Modest Reduction in Precipitation". Science. 335 (6071). pp. 956–959. doi:10.1126/science.1216629. ↑ "Classic Maya Civilization Collapse Related to Modest Rainfall Reductions, Research Suggests". Science Daily. 2012-02-23. Retrieved 2012-02-25. 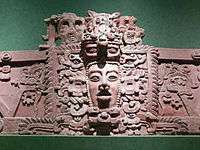 ↑ "Mild drought caused Maya collapse in Mexico, Guatemala". BBC News. 2012-02-25. Retrieved 2012-02-25. ↑ Jaynes, Julian (2000) . The Origin of Consciousness in the Breakdown of the Bicameral Mind. Houghton Mifflin. p. 197. ISBN 0-618-05707-2. Braswell, Geoffrey E. (2003). "Introduction: Reinterpreting Early Classic Interaction". In Geoffrey E. Braswell (Ed.). The Maya and Teotihuacan: Reinterpreting Early Classic Interaction. Austin: University of Texas Press. pp. 1–44. ISBN 0-292-70587-5. OCLC 49936017. Coe, Michael D. (1999). The Maya (6th ed.). New York: Thames and Hudson. ISBN 0-500-28066-5. OCLC 15895415. Colinvaux, Paul A. (1980). The Fates of Nations: A Biological Theory of History. New York: Simon and Schuster. ISBN 0-671-25204-6. OCLC 6143975.
deMenocal, Peter B. (2001-04-27). "Cultural Responses to Climate Change During the Late Holocene" (PDF Reprint). Science. New York: American Association for the Advancement of Science. 292 (5517): 667–673. Bibcode:2001Sci...292..667D. doi:10.1126/science.1059827. PMID 11303088. Diamond, Jared M. (June 2003). "The Last Americans: Environmental Collapse and the End of Civilization" (online Reprint). Harper's. New York: Harper's Magazine Foundation. 306 (1837): 43–51. ISSN 0017-789X. OCLC 4532730. Dunning, Nicholas P.; Sheryl Luzzadder-Beach; Timothy Beach; John G. Jones; Vernon Scarborough; T. Patrick Culbert (June 2002). "Arising from the Bajos: The Evolution of a Neotropical Landscape and the Rise of Maya Civilization". Annals of the Association of American Geographers. Washington, DC: Blackwell Publishing. 92 (2): 267–283. doi:10.1111/1467-8306.00290. OCLC 89457939. Favier, Jean (dir. and coord. ); Anik Blaise; Serge Cosseron; Jacques Legrand (c. 1989). Chronicle of the French Revolution, 1788-1799. Clifton Daniel (series general ed.) (English translation of Chronique de la Révolution, 1788-1799 (1988), Paris:Larousse. ed.). London/New York: Chronicle Publications, distributed in USA by Prentice Hall. ISBN 0-13-133729-7. OCLC 19729759. Gill, Richardson B. (2000). The Great Maya Droughts: Water, Life, and Death. Albuquerque: University of New Mexico Press. ISBN 0-8263-2194-1. OCLC 43567384. Haug, Gerald H.; Detlef Günther; Larry C. Peterson; Daniel M. Sigman; Konrad A. Hughen; Beat Aeschlimann (2003-03-14). "Climate and the Collapse of Maya Civilization" (PDF Reprint). Science. New York: American Association for the Advancement of Science. 299 (5613): 1731–1735. Bibcode:2003Sci...299.1731H. doi:10.1126/science.1080444. PMID 12637744. Hodell, David A; Mark Brenner; Jason H. Curtis; Thomas Guilderson (18 May 2001). "Solar Forcing of Drought Frequency in the Maya Lowlands" (PDF Reprint). Science. New York: American Association for the Advancement of Science. 292 (5520): 1367–1370. Bibcode:2001Sci...292.1367H. doi:10.1126/science.1057759. PMID 11359010. Kerr, Richard A. (18 May 2001). "Paleoclimate: A Variable Sun and the Maya Collapse" (PDF Reprint). Science. New York: American Association for the Advancement of Science. 292 (5520): 1293. doi:10.1126/science.292.5520.1293. PMID 11360980. Longhena, Maria (2006). Ancient Mexico: The History and Culture of the Maya, Aztecs, and Other Pre-Columbian Peoples. Neil Davenport (trans.). New York: Barnes & Noble. ISBN 0-7607-8381-0. OCLC 76818561. Lucero, Lisa J. (2006). Water and Ritual: The Rise and Fall of Classic Maya Rulers. Austin: University of Texas Press. ISBN 0-292-70999-4. Mann, Charles C. (2006). 1491: New Revelations of the Americas Before Columbus. New York: Vintage Books. ISBN 1-4000-3205-9. OCLC 72680543. Martin, Simon; Nikolai Grube (1995). "Maya Superstates". Archaeology. New York. 48 (46): 41–46. McKillop, Heather I. (2006). The Ancient Maya: New Perspectives. New York: W.W. Norton. ISBN 0-393-32890-2. OCLC 70170414. Montgomery, John (2002). How to Read Maya Hieroglyphs. New York: Hippocrene Books. ISBN 0-7818-0861-8. OCLC 47764291. Morley, Sylvanus G. (1956). The Ancient Maya (3rd ed.). Stanford, CA: Stanford University Press. OCLC 484868. Olson, Mancur (1982). The Rise and Decline of Nations: Economic Growth, Stagflation, and Social Rigidities. New Haven, CT: Yale University Press. ISBN 0-300-02307-3. OCLC 8451838. Sabloff, Jeremy A. (1990). The New Archaeology and the Ancient Maya. New York: Scientific American Library, distributed by W.H. Freeman. ISBN 0-7167-5054-6. OCLC 60170399. Stuart, Gene S.; George E. Stuart (1993). Lost Kingdoms of the Maya. Washington, DC: National Geographic Society. ISBN 0-87044-928-1. OCLC 27012239. Tainter, Joseph A (2003). The Collapse of Complex Societies. New York & Cambridge, UK: Cambridge University Press. ISBN 0-521-38673-X. Retrieved 11 October 2011. Thompson,J. Eric S.; Elizabeth Graham (1970). "Trade Relations Between Maya Highlands and Lowlands". Maya History and Religion. Norman: University of Oklahoma Press. ISBN 0-8061-2247-1. Toynbee, Arnold J. (1947). A Study of History (1st American ed., Somervell abridgement ed.). New York: Oxford University Press. OCLC 1151071. Webster, David L. (2002). The Fall of the Ancient Maya: Solving the Mystery of the Maya Collapse. London: Thames and Hudson. ISBN 0-500-05113-5. OCLC 48753878. Weiss, Harvey (1997). "Late Third Millennium Abrupt Climate Change and Social Collapse in West Asia and Egypt". In H. Nüzhet Dalfes, G. Kukla and Harvey Weiss (eds.). Third Millennium BC Climate Change and Old World Collapse. Heidelberg/Berlin: Springer Verlag. pp. 718–720. ISBN 3-540-61892-9. OCLC 35741821. Weiss, Harvey; Raymond S. Bradley (2001-01-26). "What Drives Societal Collapse?" (PDF Reprint). Science. New York: American Association for the Advancement of Science. 291 (5504): 609–610. doi:10.1126/science.1058775. PMID 11158667. Wilk, Richard R. (1985). "The Ancient Maya and the Political Present". Journal of Anthropological Research. Albuquerque: University of New Mexico. 41 (3): 307–326. ISSN 0091-7710. JSTOR 3630596. OCLC 1787802.